Headland Golf Club Embroidered. length 71cm. 100% polyester. Swoosh design trademark is embroidered on the left chest. Nike Golf Pullover Sleeveless Size L. Condition is Pre-Owned. Sent with Australia Post Prepaid Parcel Post 500g Satchel Signature. Width of bottom cuff 21 cm The pants are made from a polyester/spandex fabric which has a stretch, authentic Nike product. Outer leg 111 cm. 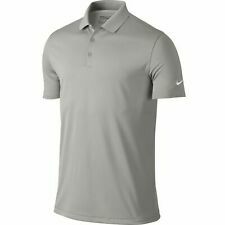 Nike Golf Tour Preformance Golf Shirt Size XL . Under arm to under are measures 65cm Condition is Pre-Owned. This shirt is in good used condition - just the odd little small mark here and there. Total length (from highest point on the shirt collar to end of the hem) - 81 cm. Armpit to end of sleeve - 12 cm. ARM PIT TO ARM PIT 52CM. This Nike Golf Tour Performance Therma-Fit 1/4 zip windcheater is in very good pre-owned condition. Nike Golf Mens White Polo Medium M RRP $79.99 BNWT. Condition is New with tags. Sent with Australia Post Standard Service Signature. Black Nike Dri Fit Mens Polo Size Men’s large. Condition is Pre-Owned. Lite fit - very cool . Nike golf polo in good condition. Material: 100% Polyester. This Nike Golf Dri-Fit striped polo shirt is i n very good pre-owned condition. Nike Golf Mens Polo Shirt Size M, DriFit, Pink. Condition is Pre-Owned. Good condition. SUPER NICE NIKE GOLF SHIRT. This shirt is in good condition. Total length (from highest point on the shirt collar to end of the hem) - 79 cm. Armpit to end of sleeve - 10.5 cm.